The PACER Service Center is the Federal Judiciary's centralized registration, billing, and technical support center for electronic access to U.S. District, Bankruptcy, and Appellate court records. The AFSA Education Foundation's (AFSAEF) mission is to help all consumers young and old - become financially literate. Programs are designed to educate consumers to realize the benefits of responsible money management, to understand the credit process and to know where to seek help if credit problems occur. ABI is the nation's leading provider of quality bankruptcy educational programs. ABI's national and regional conferences are highly rated in the bankruptcy community for their thorough discussions of the latest developments and the opportunities to earn continuing legal and professional education. ABI's conference and workshop panelists always include expert practitioners and bankruptcy judges who provide a unique perspective. Founded in 1895, the CLLA is the oldest and largest organization of attorneys and other professionals who represent the credit industry in debt collection, bankruptcy and commercial litigation. First convened in December, 1995, the Jump$tart Coalition for Personal Financial Literacy determined that the average student who graduates from high school lacks basic skills in the management of personal financial affairs. Many are unable to balance a checkbook and most simply have no insight into the basic survival principles involved with earning, spending, saving and investing. In the Spirit of Thomas Jefferson, a service of the Library of Congress. Legislative Information on the Internet. The National Organization of Chapter 13 Trustees was founded by 34 Chapter XIII trustees in 1965. Currently, more than 200 Chapter 13 standing trustees serve in the 50 states and Puerto Rico. Today, the NACTT has grown to more than 1,000 members whose membership consists of trustees, bankruptcy judges, lawyers for debtors and creditors, certified public accountants and other insolvency related professionals. Our organization is dedicated to the highest standards of education related to Chapter 13 bankruptcy and education is the focal point of the NACTT's annual seminar. Members of the NACTT receive the NACTT Quarterly, the official publication of the organization, and reduced rates on NACTT seminars. The Quarterly emphasizes local and national developments in Chapter 13 bankruptcy. The National Association of Consumer Bankruptcy Attorneys: The only national organization dedicated to serving the needs of consumer bankruptcy attorneys and protecting the rights of consumer debtors in bankruptcy. Reduced interest rate on mortgage payments. Reduced interest rate on credit card debt. Protection from eviction if your rent is $1,200 or less. Delay of all civil court actions, such as bankruptcy, foreclosure or divorce proceedings. The federal courts often are called the guardians of the Constitution because their rulings protect rights and liberties guaranteed by the Constitution. 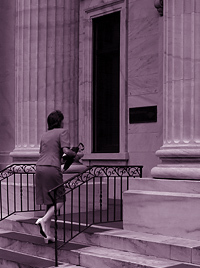 Through fair and impartial judgments, the federal courts interpret and apply the law to resolve disputes. The courts do not make the laws. That is the responsibility of Congress. Nor do the courts have the power to enforce the laws. That is the role of the President and the many executive branch departments and agencies. Official Bankruptcy Forms must be used to file and take action in bankruptcy cases. Procedural Forms also may be necessary for use during the course of some bankruptcy proceedings. Additional filing instructions, along with the forms, are available in the Bankruptcy Forms Manual below (PDF format). *Text provided from the individual websites.